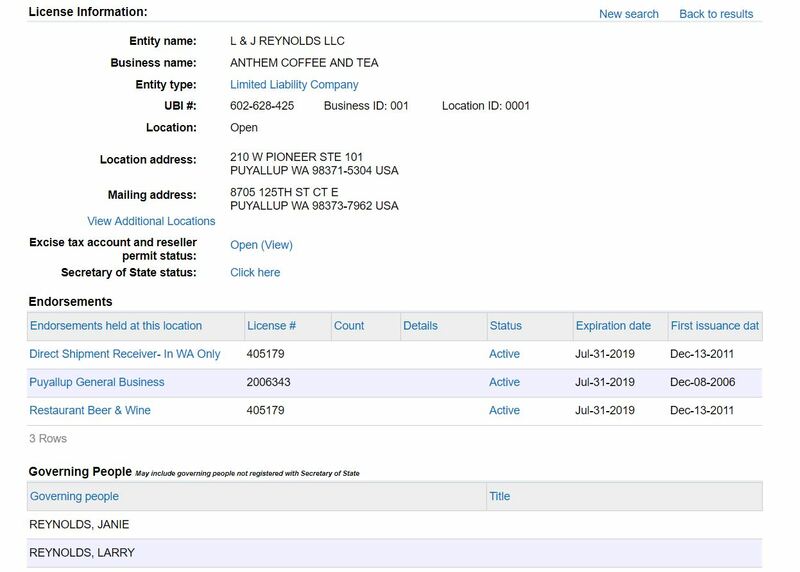 In a letter obtained by the Alaska Landmine, addressed to the Senate Joint Finance State Affairs Committee, Anthem Coffee & Tea and Elements Frozen Yogurt co-owner Janie Reynolds disputes claims made by Department of Administration Commissioner-appointee Jonathan Quick about his ownership and role in her business. Quick was appointed to serve as Commissioner by Governor Michael J. Dunleavy in late November. This was confirmed by a search of the Washington State business license. Every license under that name shows only Janie and Larry Reynolds as owners. 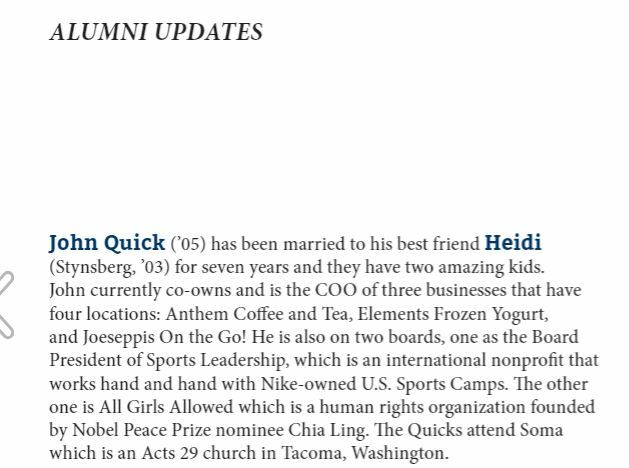 A Spring 2012 Northwest University Alumni magazine states that Quick “co-owns and and is the COO of three businesses that have four locations: Anthem Coffee and Tea, Elements Frozen Yogurt, and Joeseppis on the Go!” The entry can be seen on page 30-31 by clicking here. When he was asked how being the CEO of the above mentioned businesses will help him to guide the Department of Administration, John replied that “starting a business and owning a business is figuring out how to do it on the ground running. That experience lended itself to what it looks like to become a successful small business owner and entrepreneur”. I would like to make it known that John Quick was hired in July 2011 to organize and structure our small family business. His degree in business and our understanding that he earned an MBA qualified him for this position. He was a W2 employee at our company. After many months of promises to organize and bring structure our company, we fired him in June 2012. John never had any percentage of ownership. He had hopes of being part of the ownership structure, and would verbalize it as his reality. Several times during his year with us, he would ask, almost insist, that I sign a contract that would put him into part-ownership. I declined each time. His confirmation hearing can be seen here. His resume goes on to say that he helped to recruit and secure investors and capital sources for Anthem Coffee and Elements Frozen Yogurt. This is a false statement. No one invested in our company. All capital sources were applied for and secured by me. Public testimony was not allowed at the hearing. Quick’s appointment was referred to the Senate Finance Committee and Senate State Affairs Committee by Senate President Cathy Giessel (R – Anchorage). Because the House has yet to organize, he has not been assigned to any House committees for a confirmation hearing. After confirmation hearings, appointees must be approved by a majority of representatives and senators during a joint session. There are 60 members in the legislature. Quick claims to have entered into a “verbal agreement” with the owners. He also describes the arrangement as an “equity-stake business venture.” Does this mean he put cash or sweat equity into the business, all on a hand shake deal? You would be hard pressed to find a good business person who would ever suggest doing that. Nice diploma mills he cites there. I guess they forgot to teach “thou shalt not bear false witness against thy neighbor”. Some of us in the Kenai Peninsula Borough have been expecting this. Soon after Mayor Charlie Pierce brought Quick on as Chief of Staff, we looked at Quick’s business websites that quoted clients from non-existent businesses and made bogus claims about consultant work. Those sites all mysteriously disappeared. At KPB, he had Trump’s books on display in his office. I guess he learned that if you say something enough times, you make it true. How does this all reflect on Mayor Pierce? Sounds perfectly suited for government if you ask me. He would never make it in classified service. He isn’t actually qualified for anything and apparently isn’t willing to do the work to earn those needed skills! Why bother if you can just lie and be handed a Commissioner position without any checks?